Now that we have mastered point to point links using RM, the next major feature is generating coverage maps. For this tutorial we will be continuing with our Fictional WISP, SaharaWisp. We already have our two highsites configured, and we have a link running between the two. We are now going to be adding two 5.8ghz sectorized antennas to each tower, and plotting the resulting coverage. Start by opening your existing network file in Radio Mobile. If you have been following my tutorials, I have changed the name from SN-Grid-1 to SW-S1-Grid. This is to make identification easier. SW-S1-Grid is SaharaWisp-Site1-Grid. All units (antennae) at Site 1 will therefore have the same coordinates. The same applies for all units at Site 2. Start by selecting SW-S1-Grid and click Copy. This will copy the coordinates to your clipboard. Proceed by selecting Unit 3 in the left hand pane, and clicking Paste. This will make Unit 3's coords the same as the ones of SW-S1-Grid, also change the name to SW-S1-SN. Also do the Same for Unit 4, changing the name to SW-S1-SS. 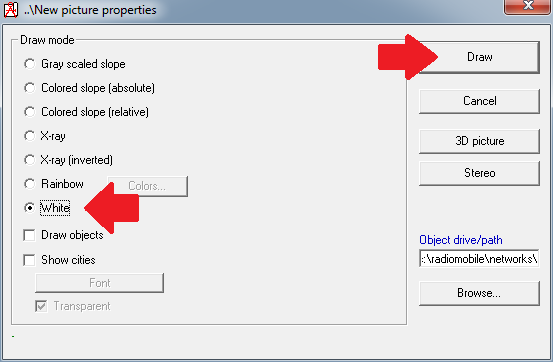 Select Unit 6 and simply name it "Client" without any coordinates. In the topology tab, you can untick the Visible box, since we don't need to generate links for any of these units. Similarly, the Topology does not actually matter, since these units don't simulate any inter-connections. Let's skip forward to the Systems tab again. We need to configure a system to act as our sector, and one to simulate a client. The client system is already configured since I will be using Ubiquiti Bullet m5 with a 27db grid antenna as my client side connection, you may choose to use something else. Select System 2 in the left hand pane, and select Mtik Metal 5SHPn - 20db/90deg from the dropdown. 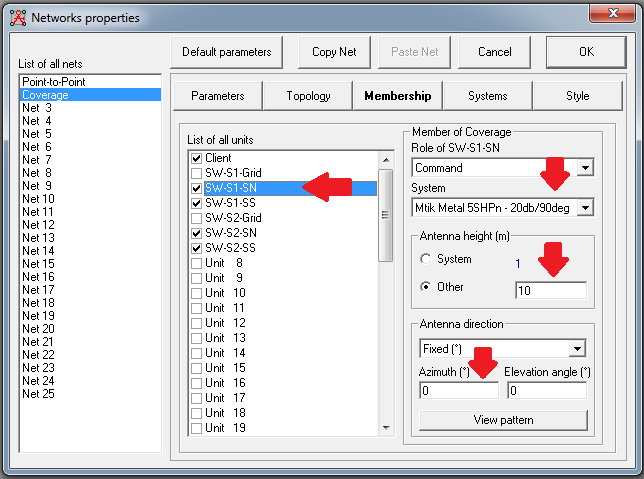 This is a preconfigured Miktrotik Metal groove on a 90 degree sector antenna. Ok, lets return to the Membership tab. Make sure that the Client unit that we created earlier is ticked and selected. You can now close the Networks Properties window. You have two ways to plot coverage maps, we will deal with both, starting with the simplest, ie. the Single Polar coverage map. 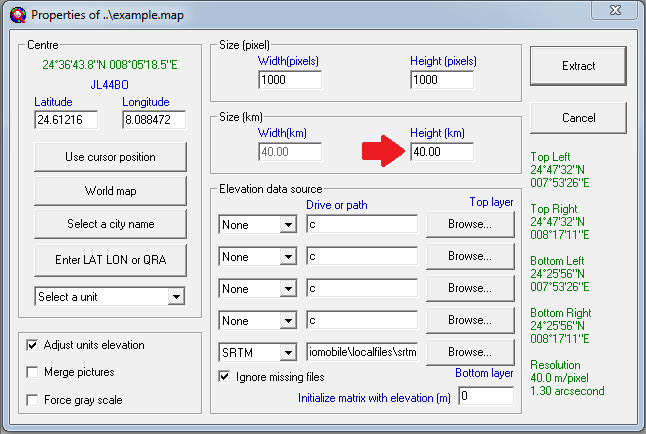 In order to contain our coverage plots, let us increase the height of the map to 40km. 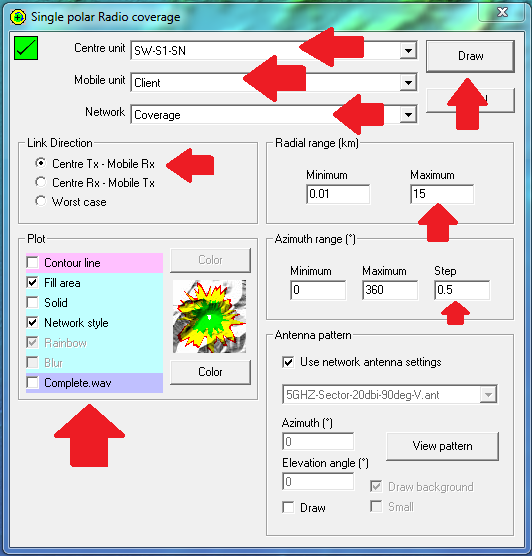 Single polar coverage allows you to plot the coverage of a single unit's coverage area. This means that it will fill the area based on the parameters defined under Networks Settings/Style Tab. This can take a while depending on your hardware and the size and resolution of the plot. You will be asked to redraw the picture in gray mode, since this is a requirement, you can simply click Yes. When it is done you will be asked what you want to do with the plot. I usually keep it in the current picture. If you open the folder where you saved these files, you will see that RM created a file called coverage.kml, go ahead and open it. 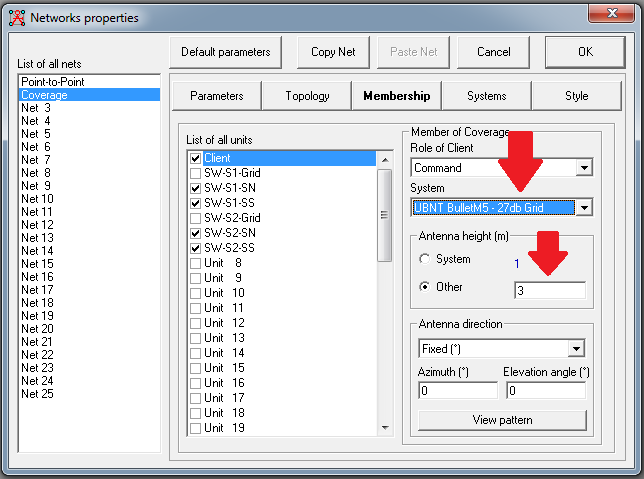 The combined Cartesian plot allows you to plot the coverage for a number of units/antennae at the same time. Note that with large networks this can take some time. My network runs for about 8 hours to generate high resolution coverage maps. It works by analyzing each pixel on the map for each tower in the list and determining the best signal from ANY of the selected towers. Since everything else stays the same, let us start with a new empty image. We are going to generate a white image here so that we don't export the topography to Google Earth. This gives you a plain white render of your area. Now, click on Tools->Radio Coverage->Combined Cartesian. Make sure all the Sector antennae are selected in the left hand pane. Note: Playing around with the Signal range unit settings can give you more satisfactory results, this is a simple example. Again, when saving it, you will also get a Google Earth KML file. Comment if you have any suggestions on how I can improve this.